Larvae feed on a wide range of wattle species, often attended by species of Iridomyrmex. Mature larvae - colour of body varies as do the markings, hairs present: head brown. 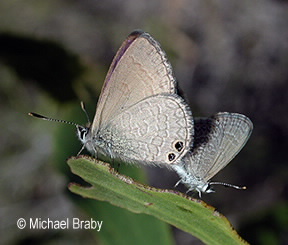 Adult male lilac with a dark blue basal area, hind with two black spots, female dull brown with blue tinge and two spots present; lower surface the fore wing is pale orange-brown with a darker band near the edge and other small bands are present, two black spots on the hind.